Ringo Starr and his All Starr Band brought a bit of nostalgia to Saratoga Springs Performing Arts Center on Friday, September 14, covering 25 well known songs from the ’80s and ’90s. 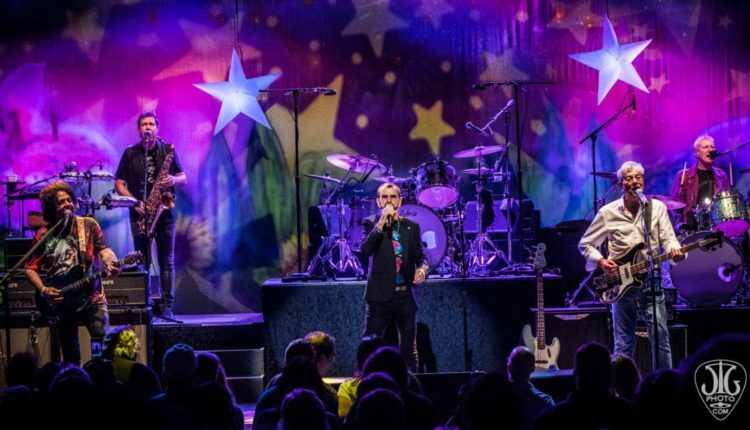 On a stage decked out with a large drape screen-printed with a peace sign, sunflowers, and stars, the former Beatle, Sir Richard Starkey, Jr., brought together an eclectic group of performers. 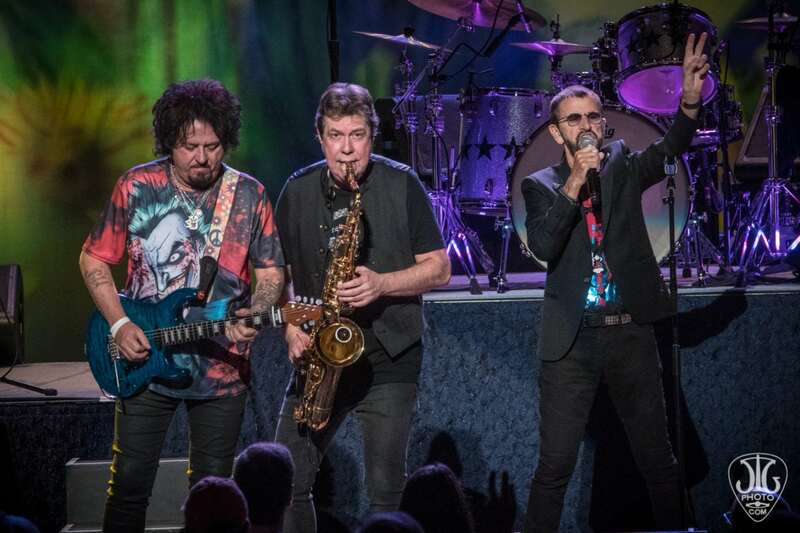 On stage with Ringo in the group were Colin Hay of Men at Work, Steve Lukather of Toto, Gregg Rolie of Santana, and newest member Graham Gouldman of 10cc. Percussion and sax featured Warren Ham, with Gregg Bissonette focused on drums..
Starr bounced out to the stage after everyone else, smiling and singing, echoing back to folks who offered “I love you” praise with “I love you too!” Flashing peace signs and telling jokes that had a canned, somewhat repetitive rhythm, Starr’s fans smiled and seemed to honor his worn humor kindly with the knowledge of a well-seasoned audience. This was Ringo Starr, after all, one of two still living former Beatles. He has earned the right to be silly and predictable. Starr, meanwhile, enjoyed himself tremendously, laughing at jokes tricking the audience and playfully engaging fans with silliness. The group rotated through their best-known hits from each ensemble they were known for previous performances in, lending a sort of cover band feeling to the night. From “It Don’t Come Easy” to “Evil Ways,” “Black Magic Woman,” “Land Down Under” and “Africa,” the music had a familiar bounce and four count. Fans had to wait for the third song to get a Beatles tune; Starr recalled that piece, “What Goes On,” was co-written by Lennon, McCartney, and Starr – and he lamented playfully that he knew the audience believed as he did that he should’ve had top billing on the authorship. Later, when “Yellow Submarine” started, fans howled their approval. This was, after all, why many spent their Friday night at the Spa City venue. Ending “A Little Help From My Friends” with Lennon and Yoko’s “Give Peace a Chance” mixed in, Ringo’s message about peace and love being “the only way” rang out throughout the park. The audience members, mainly an over 50 set who appeared to adore Ringo as much today as they did when they were in their teens, had already bought that message years ago. But they sang along, swaying in the moment with the peace of their earlier days. 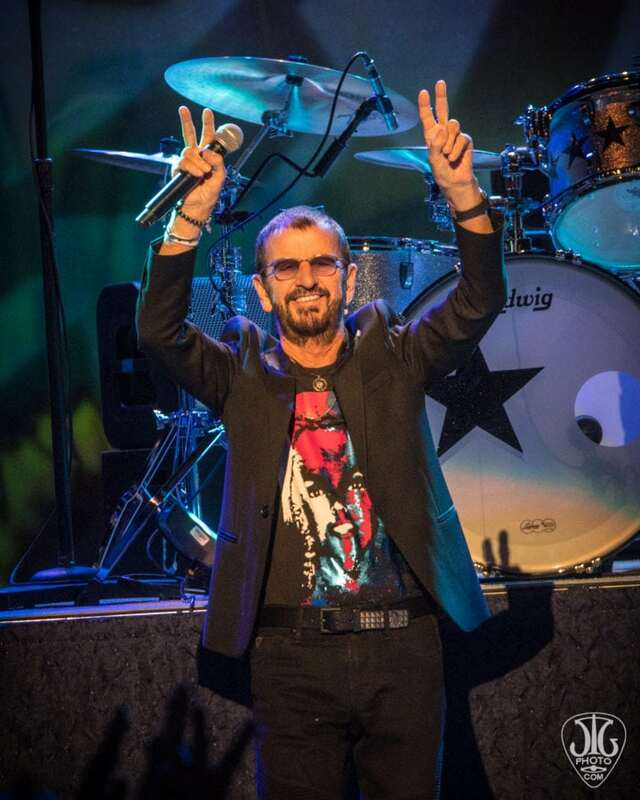 The audience even flashed the peace signs back to Sir Ringo. 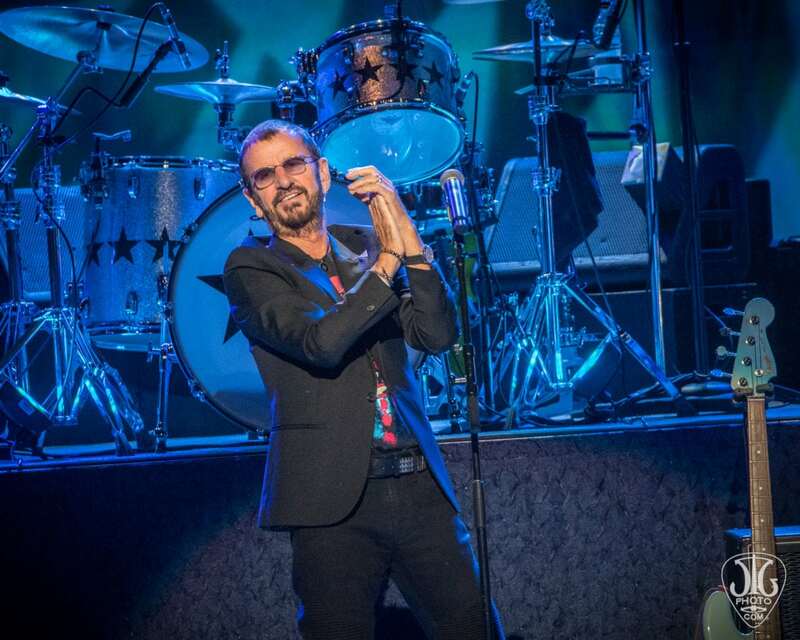 Ringo Starr and his All Starr band were somewhat predictable in their song choices and repetitive rhythm and vibe. But people didn’t come to hear new music, as much as to remember old favorites. Watching the 78 year-old former Beatle flash peace signs and cue folks to believe in peace and love was oddly reassuring though on this cool night in Saratoga. We need repetition sometimes, to remind us that the simplest messages are often the truest. Be kind. Give peace a chance. Smile more. Just like Ringo and his friends.